Advertise your business on the next Narrogin Caravan Park Tourist Voucher! 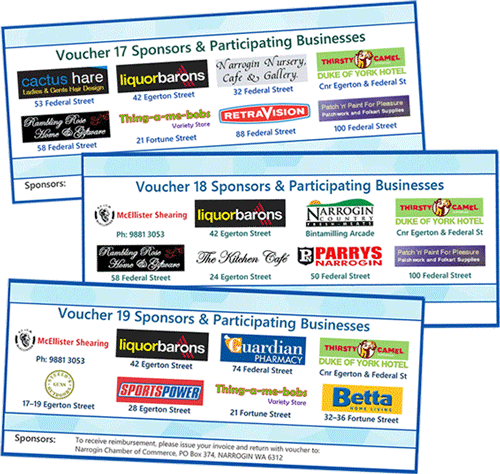 Eight member business logos are recorded on the reverse of each of the 120 run of vouchers. Included is space for an A4 size notice displayed at the Caravan Park which can advise opening hours, address, contact details and brief summary of products/services. For more information, please contact Narrogin Chamber on 0474 924 337 or at admin@narroginchamber.com.au. To register, please complete the sign up form below ASAP to enable an invoice to be issued.